“THE BOOK THAT DORIAN GRAY LOVED AND THAT INSPIRED OSCAR WILDE”. Such is the enticing epigraph of one early translation of Huysmans’ cult novel, which is also routinely called the Bible of Decadence. Accurate descriptions, both, of this bizarre masterpiece which has reverberated ever since through high and popular culture. 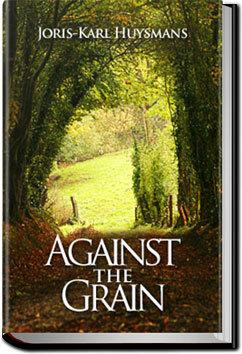 “Against Nature” (or in this version “Against The Grain”) explores to the furthest limit the life of the world-rejecting aesthete living a reclusive existence devoted entirely to artificial paradises of his own devising. This is no solemn tract, however: the book’s anti-hero Duc Jean Floressas Des Esseintes spectacularly fails to achieve his life’s work, as all his attempts to create worlds of perverse experience through synaesthesia and interior decoration prove ludicrously unsatisfying and injurious to health. An innocent tortoise also falls casualty to his theories, in the wonderful fifth chapter.